Forklift lift accidents – and other unfortunate incidents involving powered industrial trucks – aren’t just for the news. Too often, they literally hit home. In 2017, the U.S. Occupational Safety & Health Administration (OSHA) recorded over 2,100 violations involving forklifts. Forklift safety standards are established by OSHA standard 29 CFR 1910.178. 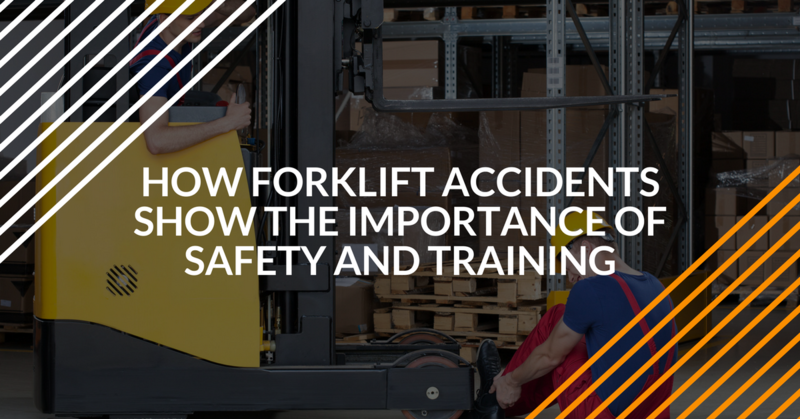 But despite the importance and high visibility of these requirements – by law, all employers with forklifts are to provide proper training to employees and contractors – accidents still happen. And they happen much more common than they should. ForkliftCertification.com, the leader in affordable OSHA training, helps forklift operators and safety supervisors create a safe and efficient workplace, thanks to our comprehensive learning modules. Our team here at FLC has tracked different forklift accidents for a while, and we’d like to illustrate how these mishaps can be used as “teachable moments,” so you can avoid accidents and disasters in the future. Let’s take a look at some unfortunate forklift accidents – and how you can apply safety strategies from each to stay safe on the job! In Hernando Beach, FL, a pair of workers were installing wheel stops on a sea wall near their forklift, which was on an incline behind them. Suddenly, the 10-ton heavy duty forklift rolled toward them, severing one man’s legs, while the other jumped from the lift. This forklift incident has several infractions, including the lift’s power mode. Both drivers basically made the hydraulic brakes inoperable. Plus, you should never leave a forklift during a tip-over. Instead, you should remain in the cabin, go with the direction, and brace for impact. This accident could’ve been a lot worse, and thankfully no fatalities occurred! Alert forklift drivers are less likely to get into accidents. In Michigan recently, a worker was killed when he was run over by a forklift driver. According to the investigation, the driver simply didn’t see the person in the forklift’s vicinity. Eliminating blind spots with mirrors and other safety markers will ensure you’re not involved in an accident like this one. Forklifts are primarily used for moving and storing cargo. When used as a lift, accidents often result. As this Idaho accident in August 2014 shows, it’s even worse when an unsecured basket is used to elevate workers. What makes this accident so alarming is that the basket was only 9 feet off the floor – showing once again that deaths from falls don’t have to be ten stories in the air. According to OSHA standard 29 CFR 1910.178, forklifts should never be used as lifts – they should only be used for their intended purposes. Every FLC training course also stresses the importance of proper, safe, sensible forklift operation. The OSHA investigation analyzed whether the company was at fault: and the result was a fine of nearly $40,000. In James City, VA, one forklift driver fell victim to a common cause of lift accidents: shifting loads. The worker’s hand was caught in a moving pallet load, which resulted in a serious hand injury. What can you learn from this accident? Number one, you should always exercise extreme caution when moving a pallet or other load on your forks. And two, always ask for extra help if you think your forklift is becoming unstable. Usually, you don’t think that forklift service or repair can be dangerous. But accidents happen to maintenance personnel all the time. For example, Evaristo Alvarado (a forklift technician from Illinois) was tragically killed when he was caught between the forklift cab and the lifter. Because Mr. Alvarado was an experienced technician, the resulting OSHA investigation took months. And while no public announcement was made about this forklift accident, one thing is for sure: you should keep safety in mind whether you’re operating a forklift, or servicing one! Let’s stick with the maintenance theme for a minute. OSHA requirements include a well-defined set of service guidelines for any forklift – proper tire inflation, safety system checks, and many others. And when maintenance is skipped or ignored, the chance of injuries and fatalities go through the roof. In one forklift incident, a worker was struck by a reversing lift. The forklift had defective backup signals and horns, which caused the worker to have both of his legs amputated. Obviously, the lesson learned here is that you should ensure your forklift is always properly maintained. It happens so often, it’s almost like clockwork: unloading cargo from a truck onto a lift gate. But for one pallet jack operator, it nearly cost him his foot. During a routine unloading procedure, his pallet jack shifted from the rear load, which pinned his foot. Luckily, he escaped with “only” an injury – but it could’ve been worse. Always know how much load you’re carrying, whether it’s a front load (forklift) or rear cargo (pallet jack). FLC’s forklift and powered industrial truck training includes different ways to avoid pallet jack and forklift accidents just like this one. FLC’s training courses – Train a Trainer, Training Kit, and our popular Bundle Package – review critical OSHA safety concepts, and reinforce the skills and knowledge you need to become a safety-minded forklift operator. We’ll also show you how to safely run a pallet jack and other powered industrial trucks. The key to avoiding accidents is thorough operator training. And FLC provides the best possible training at an exceptional value. Plus, we offer lifetime customer support and renewal training, too! Get started today with FLC! If you have any questions about our training, or if you’re interested in helping your company avoid forklift accidents, give us a call today at (888) 278-8896. You can also send us a secure message at our contact page. Thanks for visiting FLC – we’re ready to become your #1 OSHA forklift training source.